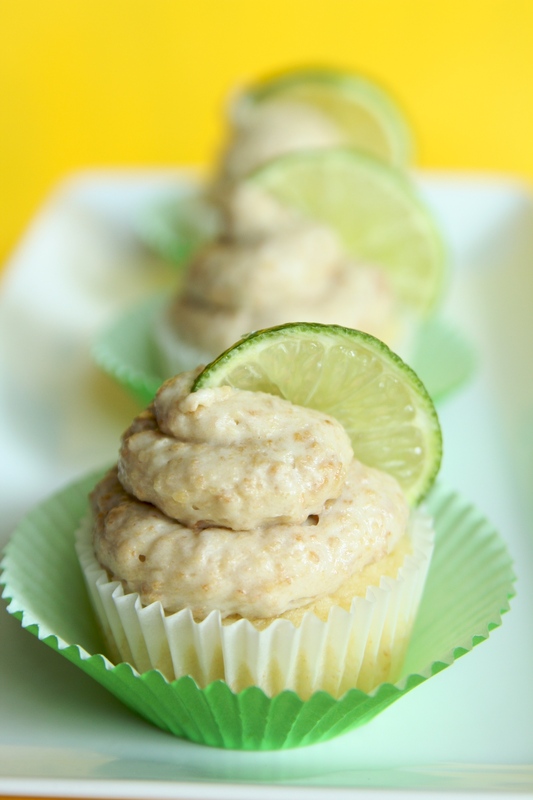 Technically these are Upside-Down Key Lime Pie Cupcakes. They are quite delicious, cool and refreshing. There are three things you should know about these cupcakes. First, true key lime pie has only three ingredients, lime juice, eggs and sweet and condensed milk. So the fact that the cake has these three ingredients is a good thing. Second, you may substitute all purpose flour and cornstarch for the cake flour if you don’t have any on hand. For every cup of flour remove 2 tablespoons and add 2 tablespoons of cornstarch. Finally, this recipe is adapted from Cupcake Project. In a small bowl, whisk together flour, baking powder, and salt. Set aside. In a medium-sized bowl, cream butter and sugar. Add eggs into butter/sugar, one at a time. Mix sweetened condensed milk and key lime juice into wet ingredients. Combine dry ingredients into wet ingredients until just combined. Divide evenly between 12 cupcake liners. Bake at 350 F for 20 minutes or until cupcakes bounce back when touched lightly. In a large mixing bowl, mix butter and cream cheese until light and fluffy. Add in the powdered sugar a little bit at a time. Mix in vanilla extract. Fold in graham crackers. Pipe or spread onto cooled cupcakes. I like to keep them in the refrigerator and serve them chilled…so refreshing!